Gene editing market size was valued at USD 3 billion in 2017 and is expected to witness 14.5% CAGR from 2018 to 2024. Technological advancements in the biotechnology sector will escalate the market growth during analysis period. Advancements in technology enables availability of gene editing techniques that are efficient enough in treatment of a particular genetic disease as compared to the conventional therapies. These therapies are highly preferred by the researchers and scientists. For instance, recently developed CRISPR-Cas9 systems are being used extensively as it is more accurate, cheaper and efficient than the existing methods. Increase in funding for genetic research in developed as well as developing countries will augment the gene editing market growth over analysis period. Genetic research typically involves studying genes at molecular level. The data obtained from genetic research can be used in the process of gene editing that proves beneficial for the industry growth. Gene editing involves use of mutated genes for various industrial and agricultural applications. For instance, gene editing technique is utilized in producing biologically engineered crops to increase the yield. Moreover, government funds various research activities related to the treatment for various diseases that will propel the market. However, stringent government regulations may restrain the industry growth in forecast years to some extent. 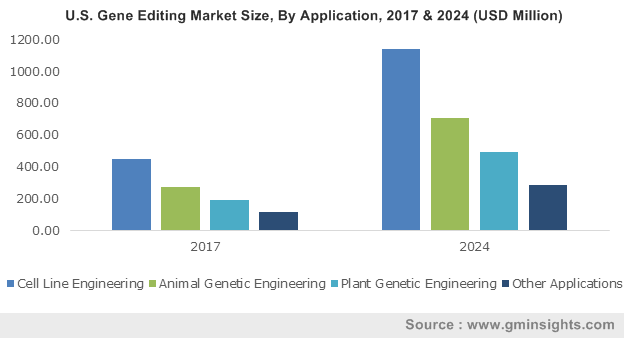 Animal genetic engineering segment was valued at USD 785.4 million in 2017 and considerable revenue size can be associated with the extensive usage of gene editing in modifying animals genome sequence. Growing consumption of diary as well as other products obtained from domestic animals has boosted the demand for gene editing technique. High preference for advanced gene editing therapies for obtaining maximum output from domestic animals will surge the industry growth during analysis timeframe. Plant genetic engineering segment will experience 14.8% CAGR during the forecast timeframe. Considerable segmental growth will be as a result of availability of technologically advanced gene editing techniques utilized in modifying the plant genome. For instance, genome of various crops such as cotton has been genetically modified to increase its yield by reducing the insecticide infections. High preference for such genetically modified superior quality crops will foster the segment growth during forecast period. CRISPR/Cas9 segment accounted for 46.6% in 2017 and is expected to show similar growth trends over the upcoming years. Considerable segmental revenue share are attributable to advancements in the biotechnology sector. Moreover, increasing funding and government initiatives in research undertaken for developing vaccines and drugs will increase the demand for CRISPR/Cas9 technology stimulating the segment growth. Zinc Finger Nucleases (ZFNs) segment will experience 14.5% CAGR during the forecast timeframe. This technology has additional benefits such as the mutations made by this technology are permeant and heritable. 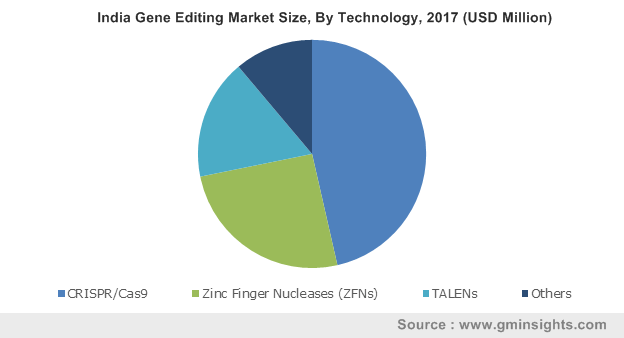 Also, the gene editing process involving Zinc Finger Nucleases results in less complications and finds numerous applications in cell line optimization that will positively influence the segment growth. Biotech and Pharma Companies segment was valued at USD 1.4 billion in 2017 and is expected to have substantial revenue size during the forecast timeframe. Significant revenue size can be attributed to growing usage of gene editing technique in research activities undertaken by pharmaceutical and biotechnology companies to manufacture and develop drugs for rare diseases. Also, leading pharmaceutical companies are investing in R&D that increases the preference for technologically advanced gene editing technique such as TALENS thereby, escalating segment growth. Research institutes segment accounted for 30.2% revenue share in 2017. Growing support of government has substantially escalated the segmental growth. Furthermore, growing incidence of rare genetic diseases in the U.S. & Europe has resulted in high demand for research activities for developing new therapies. Thus, high preference for gene editing in developing efficient drugs will propel segment growth. U.S. market will experience 14.5% CAGR from 2018 to 2014. High market growth can be attributed to the rising adoption of technologically advanced gene editing techniques amongst the researchers and scientists. Also, favorable regulatory scenario will boost the U.S. gene editing industry growth over forthcoming years. India market was valued at USD 123.2 million in 2017. Rising government initiatives that supports the research and development activities undertaken by pharmaceutical and biotechnology companies will ensure the industry growth. Moreover, high preference for gene editing techniques for manufacturing BT (Biotechnologically engineered) crops will foster Indian gene editing industry growth in coming years. 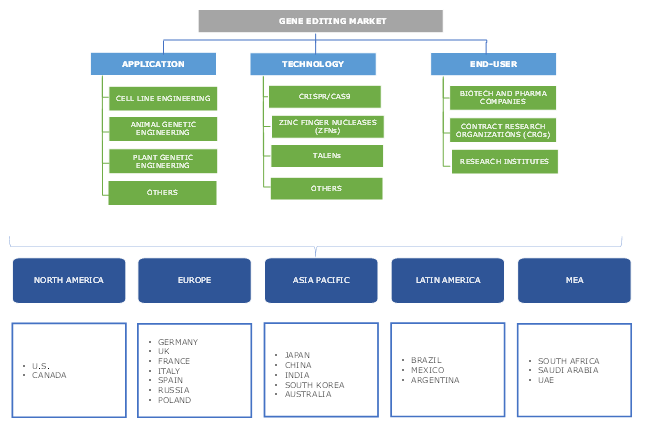 Prominent industry players operational in gene editing market includes Addgene, Allele Biotech, Bio-Rad, Takara Bio, CRISPR Therapeutics, DNA2.0, Integrated DNA Technologies and others. Key industry players implement strategic initiatives such as mergers and acquisitions to maintain their market position. For instance, in October 2016, Agilent Technologies introduced comprehensive CRISPR libraries that have various applications in transforming genome. Introduction of new technologies will foster company’s revenue generation. Gene editing industry can be traced back to late 1900’s. Zinc Finger, the first engineered nuclease technology was published in a journal in 1991 and since then, Zinc Finger was extensively utilized for ten years. However, this technology turned obsolete as it could not target certain nucleotide triplets that led to reduction in specificity. Later in early 2000’s, TALEN was discovered that was effective as compared to the previously utilized Zinc Finger technology. In 2012, CRISPR was introduced as the new gene editing tool that allowed accurate gene editing process. 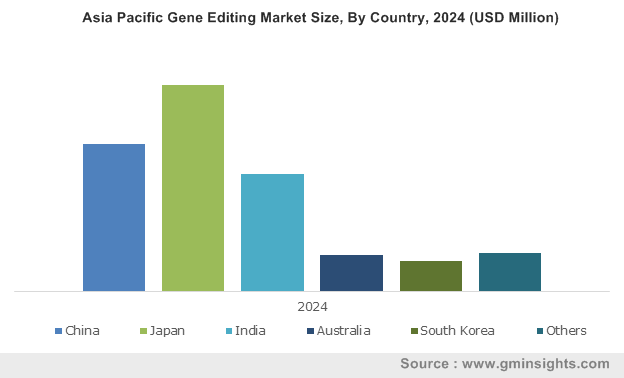 The gene editing industry is still in developing phase and will witness numerous growth opportunities in forthcoming years as the key industry players will introduce new technologies.